Mandel, Kreda, et al., SMART on FHIR, JAMIA, February 2016. D'Amore, Mandel, Kreda, et al., Findings from the SMART C-CDA Collaborative, JAMIA, June 2014. The Staying Healthy Assessment (SHA) is an individual health education survey developed by California Department of Health Care Services (DHCS). The SHA consists of seven age-specific pediatric questionnaires and two adult questionnaires. It is available in English and in all Medi-Cal threshold languages. Providers are required to administer the SHA to Medi-Cal beneficiaries as part of the Initial Health Assessment, and to periodically re-administer the assessment per contract requirements. Blank SHA forms are available to download as a PDF from DHCS. The survey is typically filled out by hand as a two page paper form. During 2016 the Lake County Health Leadership Network, a rural community health collaborative, investigated electronic solutions to automate SHA data collection and to build a repository of SHA data for use as a local population health quality measure. The Health Leadership Network SHA Data Automation Project is funded by a planning grant from HRSA and an implementation grant from Partnership HealthPlan of California. In February 2017 Redwood MedNet demonstrated a software solution for automating SHA data collection to the Health Leadership Network, Partnership HealthPlan, and DHCS Office of Health IT. In March 2017 the Health Leadership Network requested a proposal from Redwood MedNet to build the SHA data service. In June 2017 Redwood MedNet and the Health Leadership Network signed a Letter of Agreement to build a pilot instance of software to automate SHA data collection. The pilot software deployment will begin testing the new SHA data collection service in September 2017 at a community clinic in Lakeport, California. 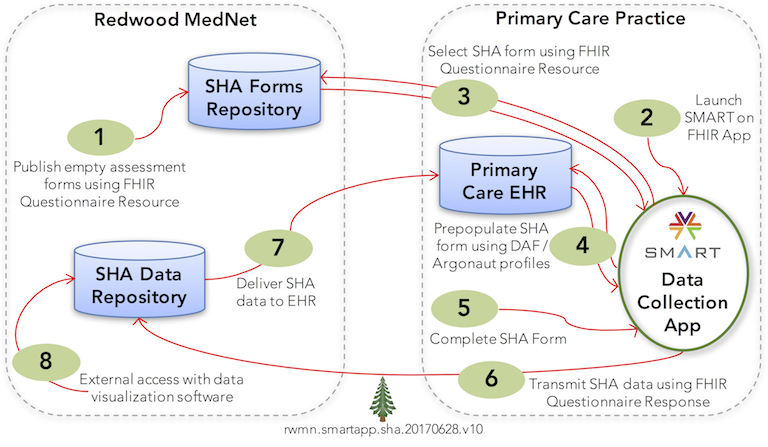 The Redwood MedNet SHA data collection service is built as an iPad application using SMART on FHIR as the software stack, with Argonaut profiles to access patient demographics from the EHR. The SMART app exports assessment results as JSON data objects, provides the outpatient practice with an electronic file for each assessment, and populates a SHA repository for access with data visualization tools. The illustration below shows a high level diagram of the generic SMART on FHIR data service. For more information about the Health Leadership Network SHA Data Automation Project contact smartonfhir@redwoodmednet.org.